Katie and I saw Last Jedi opening night, of course, and this was my initial, knee-jerk, non-spoiler reaction: mixed feelings. Some aspects I loved; some I wasn't so sure about. Some comedy was lol; some fell flat. Some emotional beats gave me #allthefeels; some felt unearned. Some plot points confusing but mostly good tension that kept me guessing. It's a long movie with a lot going on so it has taken me longer than usual to unpack and process. After a second viewing, though, and much discussion, I am now ready to share my full review. WARNING: THERE BE SPOILERS BELOW! OK, let's do this thing. Let's start with the obvious: this is an audiovisual tour de force. Both times I have seen it have been in IMAX and it has simply been breathtaking - literally! During the silent period during which Holdo's ship light speeds through Snoke's, there were audible gasps all around me. The movie doesn't just look beautiful; the score is amazing as well. John Williams has come through once again. This time he didn't invent any iconic new themes, but he did blend many familiar ones in ways that really heighten the emotional impact of what is happening on screen. The actors brought their A games. There are several emotional scenes and, because the actors killed it, I had all the feels. Last Jedi features some of the best action we've seen yet in the Star Wars universe. Rey and Kylo's fight against the Praetorian Guards was very well choreographed and I loved Kylo and Luke's Samurai / Western standoff on Crait. By giving each character a distinct fighting style they illuminate the differences between them. I also enjoyed Poe's aerobatics more in this movie because they weren't undercut by the extremely contrived, "That's one hell of a pilot," as the were in The Force Awakens. In Last Jedi we get to see what makes him "the best pilot in the Resistance." There are some genuinely LOL moments (although I'll discuss the downside of them in the BAD section). Yoda returns to form as a puppet and as a whimsical, laughing, old Jedi. I missed this version of him! I'm really glad that Rey's parents turned out to be nobodies. I think the message that you don't have to be born into a "pureblood" family to be strong with the Force is a really great one - and is reinforced by the child we see at the end. The film sets up payoffs far in advance. For example, Kylo says to Rey that she can't be Force projecting herself across such great distance because the effort would kill her. Much later, Luke Force projects himself across a great distance . . . and the effort kills him. Luke tells Rey early on that everything she said was wrong . . . and then tells Kylo the same thing at the end. I appreciate the attention to these little details. While The Force Awakens featured many familiar beats that seemed repetitive, familiar beats in Last Jedi were often subverted. Snoke's throne room showdown, defending a base against ground assault on a white planet, etc. - these are all things that seem familiar but then, to paraphrase Luke, they don't go the way we think. In such a way, these beats "rhyme with" previous beats rather than repeat them. The repeated subversion of our expectations also builds good tension. One way in which expectations are subverted is that, in multiple subplots, our protagonists actually fail to achieve their objectives, which I really like. Because Star Wars is more fantasy fairy tale than it is sci fi, we come to expect our exceptional heroes always to win out - and it really throws us for a loop when they don't. That's refreshing and, moreover, it is thoroughly coherent with one of the movie's messages that it is OK to fail. It was a bold move to kill off not only the primary antagonist (and before the third act!) but also the greatest hero of the franchise. I appreciate that this movie took more risks than The Force Awakens - although not all of them paid off (See below.). I remain really impressed that, after 40 years and eight films, they are still innovating creatures and vehicles. Every movie features some interesting new stuff and this one is no exception. I'm far from the only person to call this out but the Canto Bight subplot didn't work for me. It felt like a monolithic side quest that took a lot of time and really didn't add much to the narrative or characters. Moreover, I was really underwhelmed by their entire realization of Canto Bight. Given an infinite budget and the goal to create a galactic version of a casino planet, what do we get? Basically a terrestrial casino with a slight alien "skin" over it. Really disappointing and not very creative at all. Although I found some of the comedy pretty funny, I found much of it to be tonally incoherent. In a film that did a good job building tension, setting the stakes, and bringing real gravitas to the plot, I too often found myself pulled out of the movie by jarring humor that just didn't seem to fit. The other side of the expectation subversion coin is that I felt the movie tried too hard - and too frequently - to introduce "twists." From the opening bombing run to the throne room showdown, to Holdo's light speed maneuver, the film tries over and over again to lure you into thinking things will go one way only to reveal that they unsurprisingly are going the opposite way. This trope gets old very quickly for me. Some reveals I thought were fantastic - like Luke Force projecting himself - but these myriad others were cheaper and generally unnecessary. The basis for a major portion of the plot makes no sense. Fuel isn't necessary to maintain a constant speed in space; it is necessary to accelerate (and possibly maintain basic ship functions). If the Resistance ships were lighter and faster than the star destroyers, they should have been able to run away from them. I don't lean too hard on sci fi movies to get everything right, but this is really basic. I didn't buy the Rose-Finn romance at all. It came out of nowhere and seemed completely unearned. It also seemed cheap that Rose - a career mechanic - was able to pilot a snow speeder deftly at the end. Because . . . the plot required it I guess? For the second movie in a row, Domhnall Gleeson was completely wasted. Hux went from being a total caricature of a petulant child (with poor writing to boot!) in The Force Awakens to being a total caricature of a petulant child and a foil for comic relief in Last Jedi. It makes no sense that this character would be a general at all. And speaking of wasted actors, it was nice to see Gwendoline Christie get a little more screen time in this film but she was still largely wasted. Other than cool armor (Why don't all the storm troopers have it since it seems to be the only armor that actually protects against blaster bolts??) her character doesn't bring much to the narrative and that's a shame. 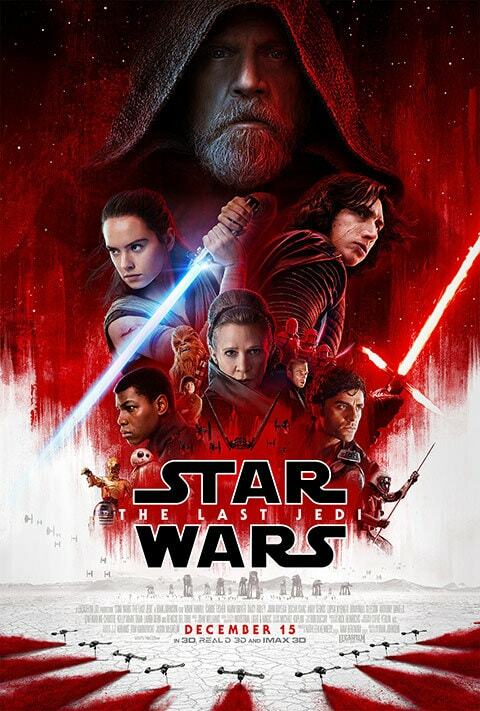 The worst part of this movie by far was the Holdo-Poe subplot, which felt ridiculous and entirely manufactured. Poe has been described as the best pilot in the Resistance and he is clearly a leader among his squad. It seems entirely goofy to me that he and Leia would not be on the same page regarding the objectives of his squad's mission (evacuate safely, not destroy the dreadnought) and then everything he does after that seems even more contrived. We really didn't see much of Poe in The Force Awakens so I can't claim that this writing is incoherent with his established character; it just didn't seem very believable to me. On top of a manufactured conflict from Poe, Holdo then seems written in an equally unbelievable way. She is condescending and insulting to Poe and then she is deliberately keeping her crew in the dark about her plans (She then chastises Poe for doing the same thing. ), which is piss poor leadership in a crisis situation. You can do some mental gymnastics to explain away her behavior but it also feels very contrived. The entire point of this sub-plot seems to have been to teach Poe a lesson - but what lesson? That the Resistance should strive for blind obedience to authoritarianism - the very thing that they are fighting?? The consequence of this subplot is that this is the first Star Wars film that feels really episodic to me. It reminds me of a Clone Wars or Rebels episode: there is some manufactured conflict with one character clearly needing to learn some lesson; hi-jinx ensue until said character learns his or her lesson. That formulaic heavy handedness is appropriate for a half hour kids show - but not for a Star Wars film. Also, why didn't Holdo turn around immediately and go light speed through the ship instead of waiting until many Resistance transport ships were lost? Everything about this subplot is wrong. I found Luke's final act to be awesome in just about every way. From the epic Samurai / Western showdown (audiovisually stunning) to the reveal that he is Force projecting (another moment when there were audible gasps in the audience) to his peaceful death before a binary sunset, I just loved it. Rey said the Resistance needed a legend, to which Luke responded, "What do you think I'm going to walk out with my laser sword and take on the entire First Order?" And then he does exactly that. Except he does it in a way that outsmarts his opponent rather than beating him physically. Rather than beating Kylo with a lightsaber, he beats him through a much higher command of the Force. It is transcendent and it is glorious. The messages in this film may be some of my favorite in the series. Anyone can be strong with the Force. Failure is a great teacher. No one is ever really gone. This last message struck me particularly hard as I recently lost a dear family member. Given this trilogy's role in moving away from the original trilogy characters we have loved for decades, Luke's final words weren't just to Kylo; they were to us. The Last Jedi has plenty of good and plenty of bad. After two viewings, I find that the good strongly outweighs the bad. The good is really good and the bad is mostly contained. It probably helps that it finishes on such a strong note. This film provided many surprises and explored new territory. It took some risks, not all of which paid off. But, as Yoda teaches us, "the greatest teacher, failure is." I, for one, will rewatch Episode VIII many more times and I am looking forward to Episode IX!